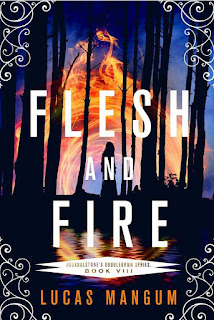 LM: FLESH AND FIRE is a supernatural horror novel with a strong romantic element. It’s different from my previous work in that, according to the rest of the world, it exists. It’s my first published novel. As part of Journalstone’s Doubledown Series (their two-books in one line), it comes with a brand new zombie adventure by Jonathan Maberry and Rachael Lavin. If it was socially acceptable to wear anything as clothing, how would you dress? LM: Without a doubt, I would put on a pair of wrestling tights and face paint, and walk the streets of my city flexing my meager muscles. That may sound weird, but that’s nothing by Austin standards. I’d fit right in, I’m sure. Maybe I’ll try it tonight. LM: I’ve always thought Belial from BASKET CASE was strangely cute. The Tall Man from PHANTASM is terrifying and formidable. The KILLER KLOWNS FROM OUTER SPACE make me feel all warm and fuzzy inside. You also can’t go wrong with killer Halloween masks that, as far as I can tell, turn children’s faces into bugs and snakes? (HALLOWEEN III) So, I guess that’s a toss-up. If you could survive on one food for the rest of your life with no health repercussions, what would it be? LM: Vegan sour gummy worms! LM: THRILLER, hosted by Boris Karloff. LM: Someone told me you void your bowels when you die, but that sounds ridiculous to me. I think people need to stop relying on poop jokes for cheap laughs. LM: I kind of think poop jokes are hilarious. Lucas Mangum is an author living in Austin, TX. He enjoys wrestling, cats, wrestling with cats, and drinking craft beer while crafting weird stories. Hit him up on Twitter @LMangumFiction and talk horror movies and books, or visit his website, www.lucasmangum.com.